Jeremie Rehak wins UEFL's 2018 Fill-In Umpire of the Year Award [2017 Winner: Stu Scheurwater]. Voting Results (Top 3): Rehak (26.2%), Nic Lentz (24.1%), Ryan Blakney/Chris Segal (12.1%). Award Winner: Jeremie Rehak (35). Jeremie Rehak is the Umpire Ejection Fantasy League's 2018 Fill-In Umpire of the Year. In his first season as a Major League fill-in, Rehak ejected four people over 98 MLB games officiated (fellow rookie Jansen Visconti worked 109). Rehak's first career ejection of John Gibbons in May concerned a no step balk and drew praise similar to that Fletcher received for calling the crucial balk in Seattle referred to in the Most Improved Award: "This was absolutely textbook situation handling by Rehak. First, he had the stones to call the balk. Then he puts up the stop sign for Gibbons and then runs him with a signal that particular ejection called for. Then he walked away right after the crew chief showed up. A real pro." 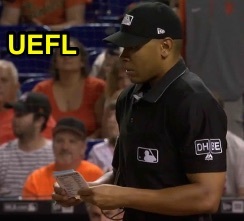 Related Post: MLB Ejection 033 - Jeremie Rehak (1; John Gibbons) (5/6/18). Rehak finished 72nd in Replay Review, with five upheld calls over 13 chances (.385 RAP); Rehak's eight overturned calls mirrored the league average. Rehak served in the International League in 2018, his third overall season in Triple-A. Jeremie is presently officiating the 2018 Arizona Fall League alongside fellow first-year call-up Visconti. Related Posts: 2018 International League Umpire Roster | 2018 Arizona Fall League Roster. Jeremie Rehak now has 18 points in the Umpire Ejection Fantasy League (16 Previous + 2 Award = 18). The next postseason award, Crew Chief of the Year, will be released later today.